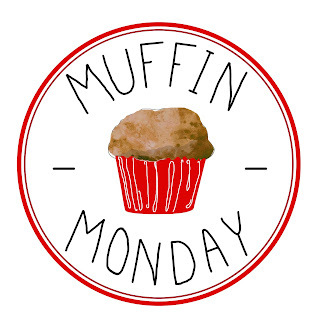 For today's #MuffinMonday reveal day we were challenged to take a LEAP of faith for Leap Year and pick an ingredient we weren't familiar with or that we'd not used before in muffin form. I received some Rose Water awhile back from Nielsen Massey but hadn't used it yet and I thought this might be just the opportunity to test it out so I searched for a muffin recipe with rosewater. There aren't a whole lot that popped up, but this one sounded very intriguing to me (and I have a freezer full of overripe bananas that really need to be turned into muffins). Lindsey and her "cheese" for the camera! These muffins had great potential - we loved the texture and the bananas with the white chocolate chips, however the rosewater was very overpowering. You can smell them before the first bite, and the taste stays in your mouth for awhile afterwards - somewhat like when you accidentally inhale after spraying perfume! I would love to try these again, but would opt for about 1/4 tsp of the rosewater at most to start with and go from there. Preheat the oven to 400 degrees. Spray a 12-cup muffin tin generously with nonstick cooking spray. Set aside. In a large bowl, blend together the egg, milk, oil, rosewater, and mashed banana until evenly combined. In a separate bowl combine the flour, sugar, baking powder, and salt. Stir dry ingredients into wet until just blended, then stir in the white chocolate chips until just mixed. In a small bowl, cut the butter into the brown sugar, flour and salt, until coarse crumbs form. Sprinkle evenly over each of the 12 muffins. Bake for 20-25 minutes in the preheated oven until golden. A toothpick inserted into the center of the muffins should come out cleanly. Remove from the oven. These can be enjoyed immediately, or stored in an airtight container for up to five days. Yeah, unfortunately rosewater is a flavoring that many people love, especially in the part of the world where I live now, but for a lot of us who are unused to it, it tastes like bath soap. I have a dear friend that would adore your muffins, Rebekah! I have baked rosewater cookies, and agree, a little goes a long way. The bananas and the white chocolate seem like the perfect foil for the rose flavor. I'm sorry they didn't turn out as expected. I have never cooked with rosewater so I am happy that when I do I can learn from your mistake. Well, you live and you learn. I'm glad it was a gift and you hadn't spent lots of money on the rosewater for this outcome! The combination of flavors sounds pretty intriguing to me. Shot Glasses for the HP Fan in Your Life!